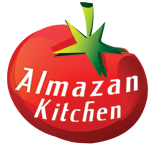 An interesting recipe improvised by the AlmazanKitchen! Coal baked organic peppers stuffed with homemade sausage filling cooked in clay cookware, on coals. Beautiful winter scenery and incredible food. Pretty unusual dish, right? Set up the fireplace outdoor. Prepare your cookware and ingredients. Take 2 bell peppers, cut it in half and remove the seeds. Slice & dice 1 onion. Remove the skin from 2 homemade white sausages. Flatten it out, salt & pepper then roll it up with onions inside. Fill the bell pepper halves with meat. Crack 1 egg. Salt it and then whisk well. Add ½ cup of cream, whisk everything one more. Grate ½ cup of homemade cheese. Take handful of cherry tomatoes, make a cross-like incises on the top. Preheat your cooking clayware Oil it up. Put the stuffed peppers in the pan. Make a holes in the center of the meat. Fill it with cream-egg sauce we previously made. Add some cheese above. Follow up with handful of incised cherries. Cover with lid and bake until cheese melts and gets a crispy golden brown texture with meat cooked well. The only difference was I couldn’t get fresh dill so I used fresh thyme instead cooked over an open fire god they were good. Made the grilled veggie salad so good can’t wait for more sunny days instead of rain to try more of your ideas.